When you walk in the street or take part in some special occasions, do you want to be charming and attractive among others? Or are you tired of wearing the same booties with others? How could you miss these trendy outfits? This pair of comfy boots has zipper decorated on the side. You will like their antiskid, durable and waterproof design. With the chunky heel, you could be at ease when you dress in the comfortable shoes. 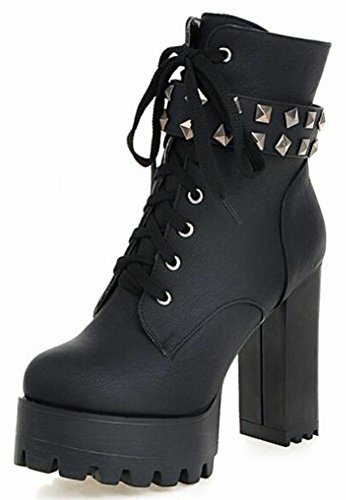 Many people are in favor of its casual, fashion and elegant style with the closed round toe, studded, ankle high and solid color. In the fall and coming winter, it's a must. They can fit any formal occasions, like wedding, party and club. With one, you will be the focus of fashion. Young ladies can buy one with your close friends. They are a wonderful gift. They are also easy-matching. Choose one suitable size so that it could fit you well. Welcome to our store. IDIFU is a registered trademark in the USA. We always work on helping every fashion lady to be unique and different. As a trendsetter, YOU ARE DIFFERENT!